Ulric stands an ordinary, sturdy height of 15.1 hands. A silvery blue roan coat stretches across a robust frame, featuring a strong, thick neck that leads into powerful shoulders with defined withers, as well as a broad, deep chest. Save for the small snippet of white on his nose, his head remains pitch black in color throughout the change of seasons, its shape slightly convex due to his breed and hosts striking eyes of gold. Most of the time, his mane is pulled and held back by a golden, metal cuff 1/3 of the way down his neck and then flows freely. Various braids of differing lengths are woven into the hair, and at the base of his withers, a long ribbon of violet has been braided in and flows freely. 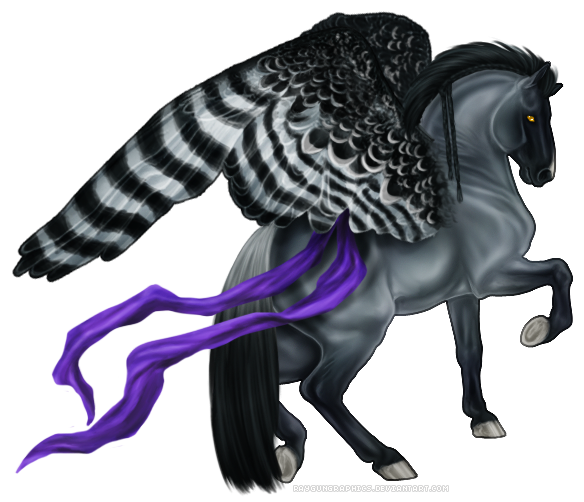 The base of his tail begins as white and mixes into long strands of black which, like his mane, host a myriad of braids. His wings are that of a harpy eagle’s, primarily dark in color on the outside and a pristine white on the inside with bands of black. The left wing, however, has been amputated halfway down the carpometacarpus as the result of a highly toxic venom from colthood, thus rendering him flightless. Ulric is confident in his abilities as a warrior and serves his people with unfaltering loyalty, whosoever they may be. Whether they are someone who has simply hired him to see them safe to their destination, a lifelong friend, young or old, he will do everything in his power to see that they are safe in every aspect of the manner. Although he worked for a number of years as a mercenary of sorts, Ulric has not been tainted by greed, far more concerned with providing a sense of safety for those in need of his services rather than the payment they offer to him. He’s committed to his line of work and can see himself doing nothing else with his life. He’s eager and determined to improve his skills in combat and despite his minor handicap, he is a resilient warrior. He values honor above all else and seeks justice where it can be found. Although he most certainly does not belong amongst the ranks of the sages, he is sharp of mind and quick-witted when he needs to be. He chooses to speak with simplicity rather than a string of long, complex words when a simple word or two will just as well convey his desired message. At times, his confidence and selflessness can come off as arrogance and even over-confidence, making him to sound as if he is gloating in the eyes of some. Ulric is a man of pride, so much so that it can sometimes get in the way of making the best possible decisions when it concerns his own wellbeing. Some might even reer to him as reckless. He’s very much aware of this fault, but try as he might, it has proven difficult to overcome. When it comes to the love, Ulric struggles. Haunted by the ultimate betrayal of his family and spending the better part of his life fighting and defending, he simply cannot fathom creating a lasting, intimate relationship. He shows the utmost respect to those who catch his eye (as well as his superiors, but that’s a different story entirely) and will most definitely turn on the charm in their presence, but it will take time to worm ones way into this hero’s heart. Ulric entered this world with a humble beginning. His parents weren’t unordinary or particularly remarkable, traveling from one place to another with a band of migratory pegasi. Their lives were simple, peaceful, and otherwise normal. The blue colt looked forward to romping with the other youngsters in their group as well as his elder sister every day, racing across flat fields, splashing through the pristine river waters of their mountainous summer home, and sometimes straying too far from the adults when they happened to not be looking. It was one such adventure, when the boy was but two months old, that everything changed. He and a small group of other colts and fillies ventured deeper into the heart of the evergreen forest that the herd always grazed the outskirts, the object of their reasoning innocent enough – to play a game of hide and seek. Taking advantage of the thick foliage and the smaller trees that stood huddled close together as well as his small size, Ulric bedded down in a cluster of bushes. After all, nobody was bound to find him there! … Except for the snake he had intruded upon. The colt’s agonized, fearful scream captured the entire herd’s attention. A close inspection revealed that his left wing had been bitten, and an even closer look brought the herd’s medic to a grim conclusion; the venom was necrotoxic, and its effects could be seen in a disturbingly short amount of time. Blood leaked from his nose, his mouth and his ears, and though they did all that they could, the medics could do nothing for the poor state of his blistered, dying wing, save for removing half of the appendage before the venom could spread further. However, this was all for the sake of his comfort and nothing more; for a Pegasus’ wings are invaluable, and without them, in the eyes of the herd, one was as good as dead. They continued to care for him after that, doing what they could to assure his comfort. Remarkably, he began to regain his strength and vigor. Even with half of one wing now gone and his balance a bit poor because of it, he slowly returned to the same brazen, outgoing colt as he had been before. Ulric expected his parents and herdmates to be happy, but no matter their mood, everyone he approached grew glum upon seeing him, including his own family, and he failed to understand why. As the day of their migration drew ever near, the colt yearned to join his friends in their flight lessons, but he was always pulled back and told he was unable to participate, ’not today’ they would always say. On the eve of their departure, his sister, Selena, bestowed a purple silken ribbon to him that she had carried with her for as long as he could remember. He’d been confused at first, but in the end, more happy than anything else to have been given such a special gift. He promised to carry it with him always, and with her help he had it tied into his stubby mane. That night, a day earlier than they had previously told Ulric, the herd left under the guise of nightfall, and in doing so, abandoned him to the mercy of the mountain. He awoke early the following morning, and it took no time at all for the colt to begin panicking. He called out, begged, screamed and cried for somebody, anybody who might be able to hear for him but nobody ever came. The colt wandered for days in desperate search of his loved ones, but they were long gone. With a heavy heart and no other options to pursue, he returned to the very place they had left him, knowing that come next spring, they would return. They had to. When winter's cruel began to take hold of his home, Ulric struggled. There was little competition in the way of finding food, but young as he was, he was far from experienced in knowing what to do and what not to do. There were predators aplenty, however, and it was only sheer luck that allowed him to flee from them unscathed. As the days turned to weeks, the abandonment began to take its toll on the boy, casting a near crippling depression over him. He didn’t want to search for food and water, he didn’t want to find shelter from the storms that ravaged the mountainsides, he didn’t want to wait it out until spring anymore; he wanted to die. Just when he was on the brink of giving up completely, a kindly equine stallion by the name of Jerin wandered high into the mountains in search of herbs where he found the shivering heap that was Ulric, his sides sunken and eyes dull with sickness. With some persuasion and a promise of shelter, warmth, and companionship, Jerin led the young Ulric away from his homeland back to a land called Adaroth. It was here that Ulric would grow strong once more and his soul slowly mend from the ultimate betrayal he had endured. It was also here that he would learn to fight under the tutelage of Piran, General of Adaroth’s army, on the zenith of his second birthday. He was spurred on by the hurt that would forever plague him, yearning to train himself to be the best that he could be, so that he might one day be able to protect those who could not protect themselves. Remarkably, Ulric took to his training like a fish to water. He was quick on his feet and possessed a drive unlike no other, and after two years of service to Adaroth, the young stallion ventured out on a mission all his own. He hired himself out to protect travelers from the dangers of the road, acted as a bodyguard for traveling emissaries, and a multitude of other tasks – anything that paid, really. After a season spent patrolling a small northern community from bandits, Ulric finds himself entering a land called Novus, where he hopes to find even greater purpose. Accessories: Purple silken ribbon tied into his mane. Small golden cuff in mane to tie it back. Various bands to hold braids in. - Incredibly self-conscious about his left wing and normally keeps it tucked closely against his side. He's incredibly jealous of those that are still able to fly, and often dreams of flying himself. - In battle, will go out of his way not to harm one's wings, friend or foe. - Has a great fear of snakes. Hi, I'm Dingo! I've been roleplaying for about ten years on various sites. Wanna plot? Hit me up!